KC 6, MIN 5: Maybe It’s Better Off This Way? When is a loss maybe a win? Well, when you think it might be best for your favorite team to sell at the trade deadline, but a recent surge has kinda sorta put them back into the playoff discussion, in theory. The way I see it, Twins fans can’t lose right now. If the team wins, great. If not, maybe in the big picture that’s for the best anyway. WPA of -0.1 or lower: Rosario -.111, Dozier -.143, Gibson -.154, Kepler -.300. In 2018, sometimes it seems like up is down, left is right and third base is left field. Well, for a moment in tonight’s game that last part was actually true. Check out this crazy shift the Twins were using against Lucas Duda below. They sent Eduardo Escobar way out there and had a three-man infield and a four-man outfield. Bonus points for creativity, buuuuuuut … Duda hit a home run. Kyle Gibson gave up four runs over 5 1/3 innings, but he pitched much better than that line would indicate. He induced what should have been an inning-ending a popup in the first, but Escobar had a hard time tracking it as he drifted out toward left field. It fell in for a two-out, two-run single. Per Baseball Savant, that ball had a hit probability of one percent. Ouch. 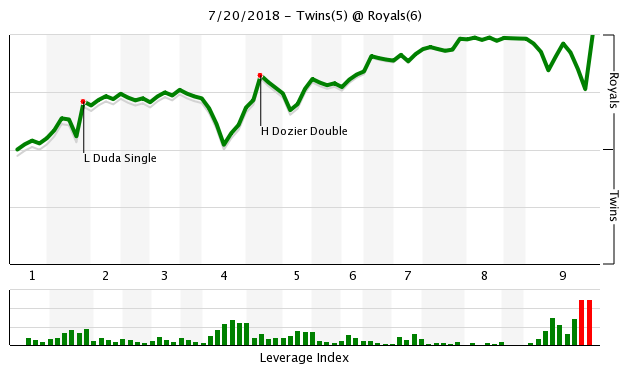 Hunter Dozier added a solid double that scored a run in the fourth before Duda smashed his homer in the sixth, so Kansas City definitely had some well-struck balls against Gibby. Still, he threw 63.1 percent of his pitches for strikes, once again did a great job of mixing things up and got 16 swinging strikes on his 102 pitches. Not Kyle’s best performance, but under normal circumstances he would’ve given his team a very good chance to win. That’s all fine and dandy, but at the end of the day the Twins lost to the worst team in baseball. It is what it is. Minnesota’s five runs came on a Kepler sac fly, a Mitch Garver triple, an Eddie Rosario fielder’s choice, a Brian Dozier groundout and a Garver bases-loaded walk. Altogether, the Twins left 11 men on base. Alan Busenitz surrendered two runs in the seventh inning that really came back to haunt the Twins. Still, KC led 6-1 at one point and the Twins managed to get the game-tying run to third base in the ninth after mounting a hard-fought rally. That’s gotta count for something, I guess. 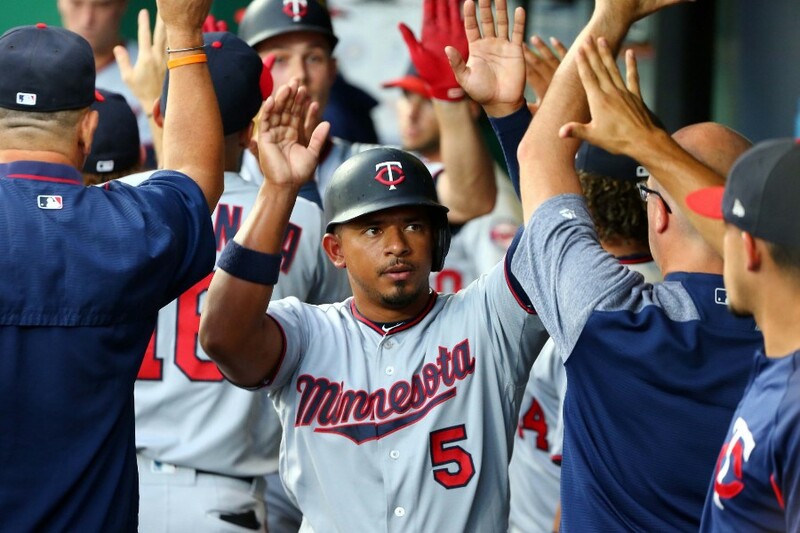 The Twins took some great at bats in the top of the ninth inning, but the one I enjoyed in particular was from Rosario, who represented the game-tying run. If we can’t beat KC we’re sellers, right? Playoff odds down to 0.7%. Escobar has to catch that pop-up. Good column. Your introductory paragraph was spot on. I enjoyed the new format. Thanks. It was fun to watch at the end. That Kepler at-bat just didn't go our way. The game was lost in the first inning when Escobar couldn't make that play down the left field line.Normally, that would be a ball the shortstop would catch.Unfortunately, our geniuses had the shortstop playing somewhere over on the right side of the infield. I know statistics tell us the shifts should work.Some time they come back and bite you in the....you know where. And with it goes the Twins season.To have any hope of getting back into this race, they need to win both series in KC and Toronto.Well, that means they have to sweep the next two games versus KC.Good luck! I didn't realize that play in the first inning had that many serious implications. Here’s what I don’t understand about shifts, using Duda as the example. Obviously Duda wants to pull the ball, so rather than play a defense designed to deal with his strength, why not pitch him exclusively outside, and play a normal defense? To me it’s like putting 8 guys in coverage against Tom Brady—you’re not going to get any pass rush, so he’s eventually going to find someone. If you shift to the right side that heavily, you have to lean away from pitches that would get hit to the left side, which is exactly what Duda wants. Yeah, it stinks that we gave up two runs there, but the offense had plenty of chances to hit in some more runs and the pitching could have prevented some. The game was certainly not over when they happened. Yeah, our season didn't hinge on that one play.Sorry.This team has lost a ton and really just doesn't have the talent to be true competitors. I like your logic, and it might help. But, part of the issue, is that today batters wear the body armor and stand right on top of the plate (not all...many). Meanwhile baseball’s own little PC movement has made it a federal crime to pitch aggressively inside to knock the batter off the plate. The unintended consequence in this case is that there is no pitch that catches even the outside corner that most pull hitters can’t pull with authority. Love the time and effort put into this. No chance they all get traded but I'd love to see the Escobar, Dozier and Reed trades. The Pressly/sano ones seems pretty far fetched but the rest seem like realistic possibilities. Duda has hit 7 ground balls on the left side of second this year. it would be a waste of time putting someone over there. Does the return for Familia from the A’s tell us anything about the market for relievers? The Mets received a 26 year old AAA reliever. The A’s need relievers and didn’t call on him though he has a ton of strike outs this year. They also received a 24 year old 3B in high A. His 741 OPS ranks him 8th on his team among regular position players. They also received international money. The Mes could have waited but took this deal. What should the Twins expect for their relievers? For that price, maybe the Twins should have been buyers. At least for the next 10 days or so. Worst case, you drop further back and flip him like Jaime Garcia. That i snot an exciting return at all.I guess they feel Wahl is gonna be good. How many times have you seen a 3B make a catch directly overhead and ~100 feet behind him, plus a crosswind? I haven't seen the probabilities, but it's probably less than 20%. That's almost always a SS or LF play, but of course, both were pre-positioned in another zip code. → Article: KC 6, MIN 5: Maybe It’s Better Off This Way?